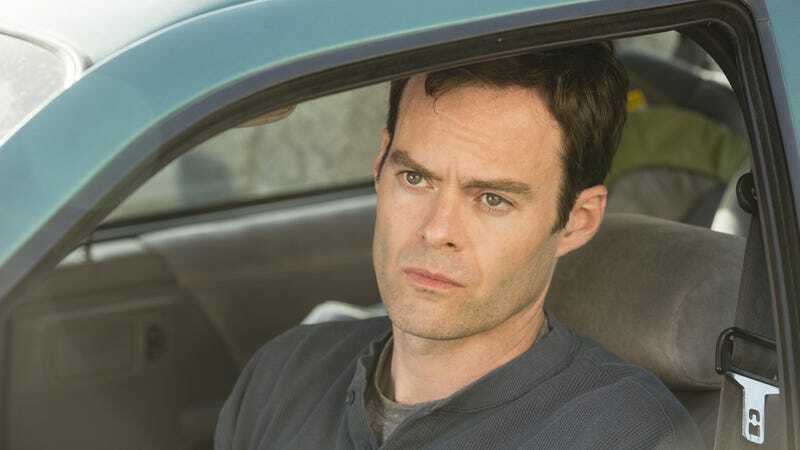 On the surface, the premise of Bill Hader’s new dark comedy, Barry, seems like it could have been pieced together from audience suggestions he heard in his improv days at the Second City Hollywood. Occupation? Hitman. For location, how about an acting class in Los Angeles? And finally, a phrase to get the scene going? Well, “existential crisis” has a nice ring to it. The ex-Marine turned hired gun turned aspiring actor that Hader plays could also have sprung from a pitch session at his old Saturday Night Live gig. In the lead-up to the premiere, the Documentary Now! co-creator has been very forthcoming about how the tremendous anxiety he experienced in his sketch-show days informed the new series, which he co-created with Alec Berg. His stewardship of the project—he stars in Barry in addition to sharing writing, producing, and directing duties—also suggests that the killer second act he’s cooked up for his stand-in has been on Hader’s mind for some time. That investment is key to the success of the show. 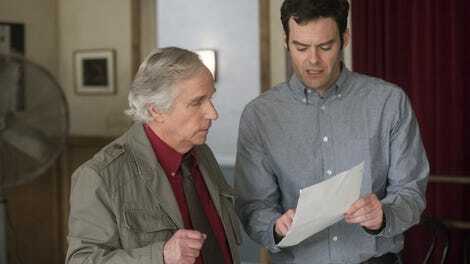 Barry has an outstanding supporting cast, including Henry Winkler, Stephen Root, Sarah Goldberg, and Paula Newsome, but the show hinges on its lead actor’s performance. After years of honing his dramatic chops, Hader adroitly leads a talented ensemble through the series’ daunting mix of tones and genres. Unlike Barry’s move from Ohio to Los Angeles, that journey gets off to a slow start, though. The show opens on the aftermath of a hit, then gradually immerses us in the world of a professional killer. But it’s obvious what Barry’s job is, just as it’s clear that he’s exceedingly good at it. As he leaves the scene of his latest crime, Barry gives himself a quick patdown to make sure he’s got everything—keys, wallet, phone, etc. His actions signal just how rote all of this has become for him. Barry’s not filing TPS reports or sitting through sales meetings, but he’s still fallen into a rut; this one’s just more potentially devastating than most. The series then widens its focus, offering up some good-natured skewering of West Coast creatives, who are presented as harmlessly deluded. They’re not the only ones—virtually every character in Barry plays the fool, whether it’s Sally (Goldberg), an aspiring actor who’s kidding herself about her chances in Hollywood, or Barry’s manager-mentor Fuches (a delightfully devious Root), who seems to think the years he spent on kitchen duty in the military make him Barry’s equal in the “badass” department. Even the Chechen gangster, Goran (Glenn Fleshler), who hires Barry can’t bring himself to face graphic proof of his wife’s infidelity. But Barry doesn’t shy away from hard truths, including the difficulty veterans face returning to civilian life, and society’s insistence that we are what we get paid to do. It just takes them to absurd extremes, warping concepts like taking pride in your work and individualism until they seem ridiculous or terrifying. This is a show in which killers regularly workshop ideas like macabre calling cards, and acting coach Gene Cousineau’s philosophy that we can assume a new life at will is also taken far too literally. Played with avuncular depravity by Winkler, Gene leads the class that hooks Barry from the moment he watches Sally go from unsure and in pain to being completely in control at rehearsal. Goldberg is great as the stymied but obstinately optimistic starlet. Although she’s Barry’s love interest, she’s very much on her own path throughout the season. But she is among the many people, including Gene, who misguidedly urge Barry to use his life for inspiration on the stage, blissfully unaware of the darkness and rage he can tap into. The result is very dry comedy early on, which can be a bit frustrating if you were expecting the kind of rapid-fire jokes from Berg’s and Hader’s other work. But when the wheels come off, as they do in the second half, the tragicomedy that ensues is one of the most compelling on TV. Viewer patience is definitely rewarded, but some of the characters still get the short shrift. Newsome manages to work wonders with what she’s given, which isn’t nearly as much as her co-stars. Like Barry, Detective Moss’ professional prowess is getting in the way of her happiness. But the writing doesn’t let her deviate enough from that routine; she’s mired in predictability as another career woman who must learn to “let go.” Fleshler and Anthony Carrigan, who plays Goran’s right-hand man, NoHo Hank, are scene stealers, but they can come across as downright cartoonish compared to the show’s grim central character. They’re frequently used to great comedic effect, though the archness of their scenes occasionally threatens to throw off the delicate balance between Barry’s broader elements and increasingly bleak drama. But these drawbacks only slow the series’ trajectory. Hader provides such a powerful core as Barry, a man so detached from his life—mostly by necessity—that he doesn’t realize creating a new one as an actor is like trying to build a house on quicksand. And his physicality has never been put to better use. Hader’s just imposing enough to be a realistic hitman/veteran, and his square jaw gives off the “reluctant gunslinger” vibe from the Westerns that influenced the show. Long before he gets his first meaty monologue, the actor’s incredibly expressive face has already communicated Barry’s desperation—and hope. His character might make a questionable move, but Hader proves he’s right at home as a dramatic lead.